The Boat-tailed Grackle was once considered the same species as the Great-tailed Grackle, though its body size is larger, it has a longer tail and lacks the Great-tailed Grackles’ distinctly flat head-shape; this bird’s head is round. This is a medium sized grackle; at just a couple inches longer than the Common Grackle. The noisy, iridescent, purple-black male has a bluish sheen visible on the head, in good light, and grading to greenish on the body. The extroverted bird is hard to miss when it displays on power lines and telephone poles. Young males are black but lack the adult's iridescence. The smaller, brown female has a shorter tail and reddish brown plumage overall, darkest on wings and tail. She is quite beautiful but is much less conspicuous and might even be mistaken for a different species. Young females resemble pale adult females, with spots on the breast. A US native and endemic only here, this grackle is resident along Atlantic coast from Long Island and New Jersey south, throughout peninsular Florida, and west along Gulf coast to southeastern Texas. 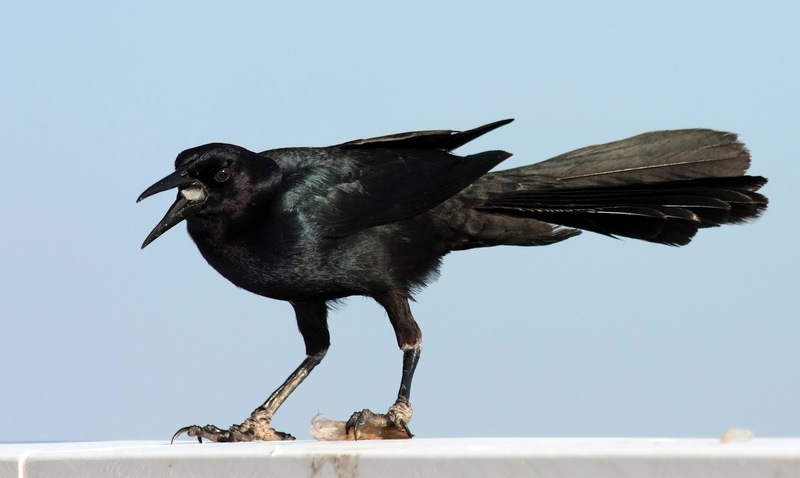 Boat-tailed Grackles have established significant populations in several United States Gulf Coast cities and towns where they can be found foraging in trash bins, dumpsters and parking lots. Their favorite station for plumage exhibition is the top of a small bush or low tree. 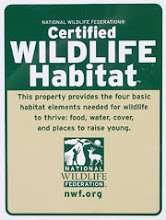 If these are not available, they will alight on the ground or on a muskrat house or pile of debris. Here they stay quietly for some minutes, with their feathers compressed and beak and neck pointing skyward, then suddenly one of them will give a series of squeaking, chuckling, raucous cries, during which all the feathers are fluffed, tail spread, wings half opened and vibrated rapidly, making a loud, rattling sound [see Voice]. The others of the group immediately follow the leader's example, and for a minute or two each individual is animated and noisy, only to drop back to the compressed statue like pose. This noisy exhibition takes place either while at rest or on the wing. If, over such a group of males, flies a female seeking a mate, all of the males at once take flight on loudly flapping wings and with rattling quills, squeaking and calling in their most seductive manner, begin chasing her. Should none of this group of males attract her, she quickly out flies them and proceeds to look over other groups until she finds her choice. When a mate is selected she flies in front of and near him, leading him off to one side, until the other males in the group drop out of the chase. The pair then alights on the ground and mating is accomplished. 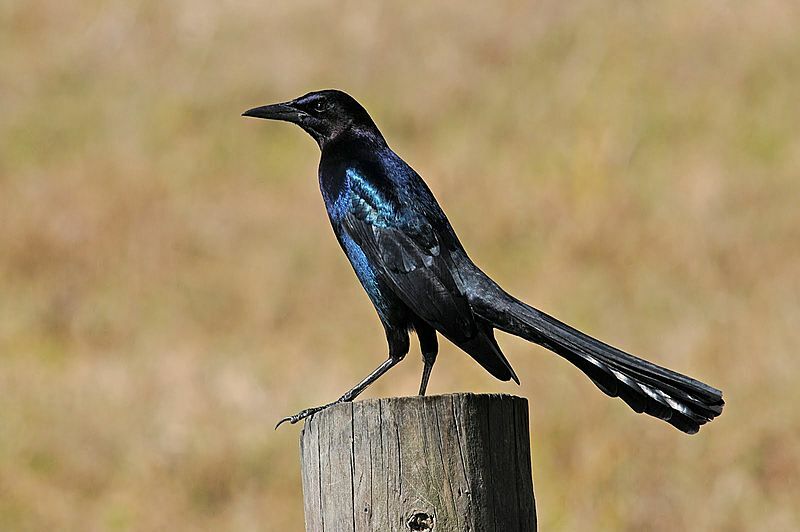 These Grackles generally nest near or over water, in willows, cattails, saw grass, bulrushes or up to 80’ high in trees. The nest is a well-concealed cup in trees or shrubs; where three to five eggs are laid. Boat-tailed Grackle eats various invertebrates, grain, some small vertebrates; forages on ground, mudflats, and in shallow water. They are omnivorous, eating insects, minnows, frogs, eggs, berries, seeds and grain, even small birds. Larger injured birds are taken by the Boat-tailed Grackle when opportunity offers; sandpipers, heron,egret and more. They will steal food from other birds…or from pet-food bowls. This bird's song is a harsh jeeb, and it has a variety of typically grackle-like chatters and squeaks, and the characteristic rolling or rattling sound; often accompanied by a wing-flutter, as shown here. Eye color in the Boat-tailed Grackle varies from region to region. 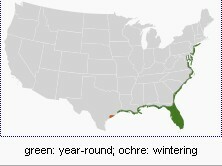 Grackles along the Atlantic coast north of Florida have straw-colored eyes. Florida birds have dark eyes. Grackles west of Florida to eastern Louisiana have light eyes, but those further west have dark ones. The Boat-tailed Grackle has an odd mating system: harem polygyny or female defense polygyny. Females cluster their nests, and the males compete to defend the entire colony and mate there. The most dominant male gets most of the copulations in a system similar to that used by many deer. But all is not as simple as it seems. Although the dominant male may get up to 87% of the copulations at a colony, DNA fingerprinting shows that he actually sires only about 25% of the young in the colony. Most of the young are fathered by non-colony males away from the colonies.